From £14.50. Family ticket £65, admits four. 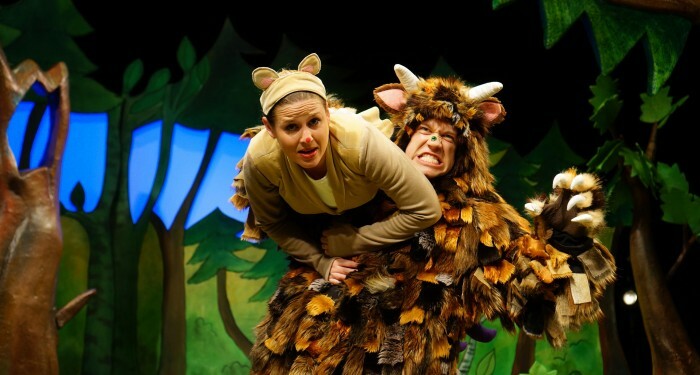 One of the world’s best-loved children’s books is brought to life in a playful adaptation of The Gruffalo that’s filled with song, dance, slapstick humour and just a teensy bit of mild menace for the youngest of theatre-goers. 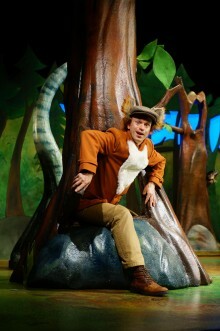 First on stage is our hero, Mouse, enjoying his woodland surroundings, but thinking there’s just one thing that would make it better. If only he could find a nice tasty acorn for supper. Brains not brawn are the saving grace for Mouse as he encounters various creatures in the forest, who wouldn’t mind munching on a mouse for supper! Using his quick wit, he outfoxes the fox, proves the Owl not so wise and even makes Snake slither away in fright, and all with the imaginary invention of a big scary creature with terrible claws. But as Mouse is chuckling away to himself about their gullibility – with the familiar refrain “Don’t they know, there’s no such thing as a Gruffalo” – who should tip up by the great hairy monster himself, complete with curly horns and a poisonous wart on his nose. What’s more, the Gruffalo is hungry. Can Mouse use his wits to get out of this one? This is a really delightful adaptation that is sufficiently true to the picture book for young children to be able to follow (and indeed predict) the narrative easily. Tall Stories have created great comedic cameos for Fox, Owl and Snake that adds a new depth, too. 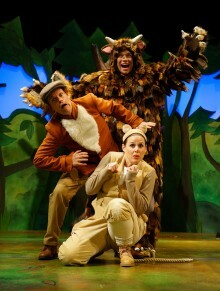 The talented trio of actors each play their part to perfection, led by Ellie Bell as a suitably gung-ho (and just occasionally timid) Mouse, and Owen Guerin as the Gruffalo, who’s more dim-witted than scary. His wonderful costume, made up from scraps of fake fur, shimmies delightefully when he moves. Special mention should also go to Timothy Richey displaying his multiple talents as a suave and debonair Fox (a clever flick of his lapels on his jacket turns into a soft furry tummy), a military-obsessed Owl and, for the biggest cheer of the day, a moustached Snake with plenty of latino olé sass who’s not shy of shaking his maracas. Fans of Julia Donaldson’s book will love this live version that keeps so much of her wonderful lyrical verse, while the spirit of Axel Scheffler’s memorable illustrations are also evident in the wonderful set design. And it all ends with a very catchy sing-along “G-g-g-gruffalo” groove that you’ll be happily singing all the way home. All we can say is thank goodness there is such as thing as a Gruffalo! 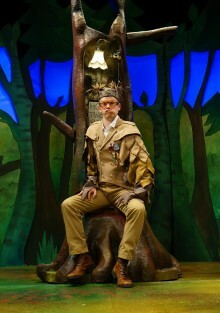 Why go To see a well-loved storybook come to life on the stage. Who is it best for The short running time and familiar story makes this a perfect first-time theatre experience for preschoolers. 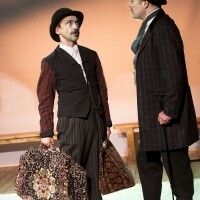 Our Favourite Bit The clever costumes, set design and talented actors really bring this production to life. Young children also make the best spontaneous hecklers! Top Tip Read The Gruffalo before your visit to familiarise your child with the story so that she knows no harm will come to Mouse in the end. Don’t Go If you really believe there’s no such thing as a Gruffalo. While You’re Here Take a stroll around Chinatown in the streets just off Shaftesbury Avenue where you’ll find colourful restaurants, food shops, souvenirs and pretty Chinese lanterns hanging from the roofs. Did you know? The Gruffalo picture was first published in 1999, and has sold over 13.5 million copies in 57 languages. 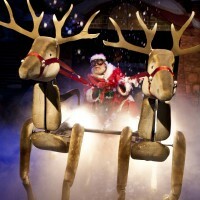 Tall Stories’ stage adaptation premiered in 2001, and has been performed across the globe in Poland, Germany, Australia, Hong Kong, Singapore, Dubai and Chile, as well as in North America from Broadway to Alaska and Canada. In the UK, The Gruffalo has even been spied on the summer festival circuit playing at the British Summertime Festival Hyde Park and Camp Bestival. Author notes Julia Donaldson is one of the most popular writers of children’s books today; her titles include The Gruffalo, The Gruffalo’s Child and Room on the Broom. Other titles by Donaldson and illustrator Axel Scheffler include Stick Man, The Snail & the Whale, A Squash and a Squeeze, The Smartest Giant in Town and The Tales from Acorn Wood Series. Axel Scheffler has achieved worldwide acclaim for his children’s book illustrations, as co-creator of The Gruffalo series, and for Jingle Jangle Jungle, Pip and Posy, and Old Possum’s Book of Practical Cats among many others. Born in Germany, Axel now lives in London with his partner and daughter. About Tall Stories Tall Stories is a registered charity aiming to inspire imagination internationally, presenting old, new and timeless stories in a physical and visual style, always acknowledging the presence of the audience. Their productions link original music with dynamic movement – and lots of laughs. The company was founded in 1997 by Artistic Directors Olivia Jacobs and Toby Mitchell, and present work from London England to London Ontario, and from London’s West End to Broadway’s New Victory, taking in Ireland Poland and Asia en route. 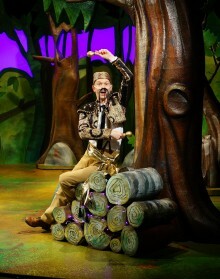 Their current productions include The Snail and the Whale (UK and Malaysia Tour); Room on the Broom (UK Tour); The Gruffalo’s Child (North America Tour) and The Gruffalo (UK Tour, West End and New York Broadway).